You're just a few tassels away from making the comfiest cold weather nest. If January's "bomb cyclone" and "flash freeze" have taught us anything, it's that this winter means business and our best option is to grab some cozy clothes, a warm bowl of soup and crawl right into bed. And since we plan to spend a lot of time under the covers, we asked DIY aficionado withwendy to show us some easy updates to make our bedding as comfy as possible. 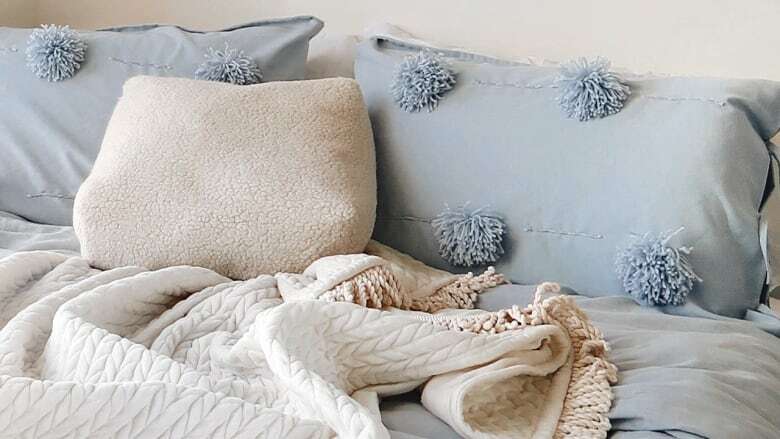 With just one trip to the fabric store, you can create a faux fur case for a spare pillow, add texture to a throw with on-trend tassels and adorn plain pillowcases with homemade yarn pom poms and stitched accents. All in just a few steps and with the straightforward instruction Wendy is known for. Watch the video below if you really want to take your snuggly nest to the next level, then check out withwendy's tutorial for sewing your very own bedding. Watch more of withwendy's DIYs here.